In my last post I talked about my process of getting to know the landscaping at my new house. I also confessed to the fact that I wasn’t totally sure which plants were weeds and which weren’t. 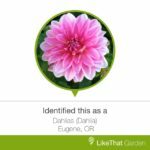 I was fairly certain that I had something related to a gerber daisy on my hands given the leaves on this plant, but have never seen this particular flower before. It is in fact a gerber daisy. 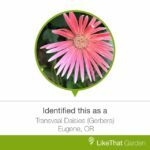 At first I thought “transvaal daisy” was some relative of the more traditional gerber daisy, but then I took a picture of a classic, store bought gerber daisy and it too was identified as transvaal. You learn something new every day. Ok so I already knew this one, or I should say my wife knew it. 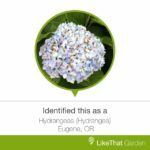 Our beautiful hydrangea bushes are slightly out of control– so much so that you will probably see a follow up post from me on what I learned about pruning them. I thought these flowers were some sort of iris. 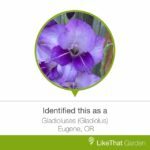 While they are a bulbous plant, I learned that they are gladioluses. They are flourishing right now and I’m so lucky to have multiple colors represented in my back yard. These flowers just started growing in a patch of weeds behind our shed. 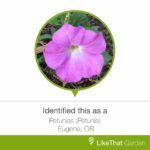 While they looked familiar, the app confirmed that they are petunias. I’ll go ahead and continue to let them grow. These dahlias are the ones I was almost certain were weeds. They had been virtually cut down to the ground during the winter. I was so close to pulling them from the ground but decided to wait and see what the plant looked like. Boy was I rewarded. The buds were fascinating and the flowers are stunning. I’m fortunate to have a few varieties of these in my back yard as well. 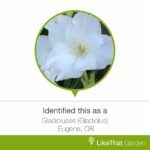 As you can see, the LikeThat Garden app did an incredible job identifying the flowers in my back yard. I also tried on a couple random plants and trees in my yard that didn’t have flowers. The app offered some suggestions that were inconclusive. It’s definitely more accurate with flowers. But believe me, this is a new obsession. I’m like an explorer discovering new land– only I’m really that guy walking really slowly down the sidewalk taking picture of plants with his phone.